Here I interview Public Relations Mgr. Larry Weeks at the 7th Annual Career Fair in Des Moines, IA. Next year’s event will be April 1-2. For info. go to www.GunsmithCareerFair.com. 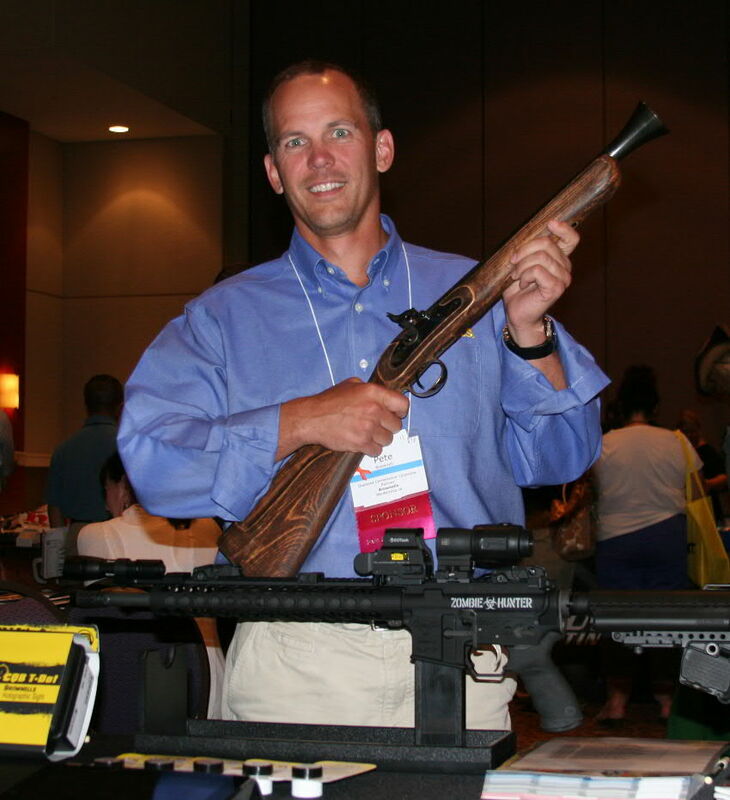 CEO Pete Brownell with the author’s blunderbuss. Like many black-powder gun writers, I not only hunt with factory guns, but occasionally put together kits and/or modify these guns so that they will better fit my shooting needs. A building project with a Sportsman’s Guide blunderbuss kit caused me to use some of Brownells’ products made by Birchwood Casey. 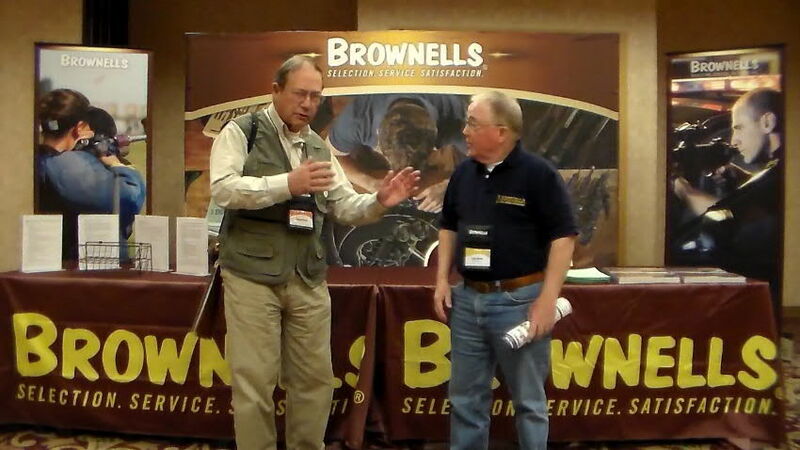 At a writers’ conference Pete Brownell, the CEO, was taken with the gun, and I was invited to attend the 7th Annual Brownells Gunsmith Conference and Career Fair in Des Moines, Iowa in March, 2013. I produced five videos from the event which are available on YouTube. The one most appropriate to this post was “How to be a gunsmith,” which may be viewed at: http://youtu.be/vPBg6hHHm2Q. It has always been interesting to me to follow the evolution of a large number of outdoor-related companies that were founded immediately after World War II that become household names. Gun manufactures included Ruger and Weatherby. Nosler, Hornady and Speer provided effective hunting bullets for sportsmen while Hodgdon marketed military surplus powders and now has a large variety of cartridge and muzzleloading powder products. Bob Brownell was a gunsmith who had trouble getting the supplies that he needed, and he decided to start a distribution company that would sell these to the nation’s gunsmiths. Starting with a handful of products shipped from his house, the company now catalogues over 80,000 items including more than 200 that were developed by Brownells. Bob’s son Frank assumed the leadership role after his father’s death, and Pete Brownell is now the CEO of the family business. If you want to hear exactly how these transitions took place, I have a video interview with Frank and Pete at http://youtu.be/fkKWwKQBV-0. This is a good example of how a family business can expand its original vision, take advantage of new market trends and adapt to supply its customers’ changing needs. The takeaway from this video is that businesses must expand to incorporate evolving changes in the market or die. The hard part is that throughout this evolutionary process they must simultaneously keep focused on the business’ purpose and its customers’ needs while avoiding unwarranted risks. 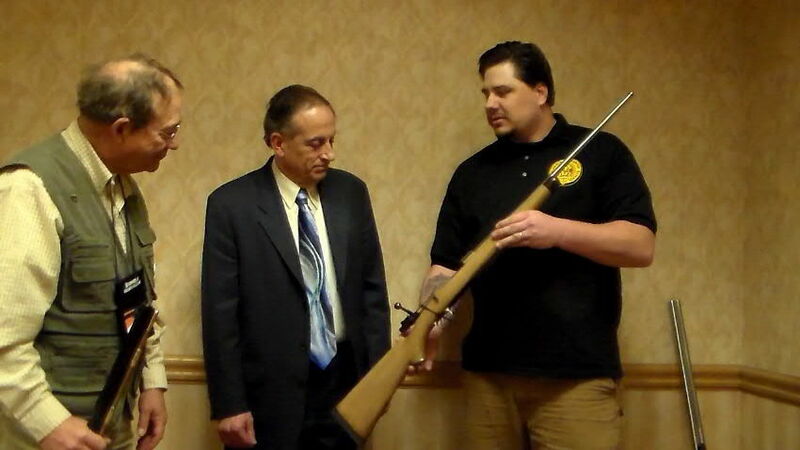 A Pennsylvania Gunsmith School student displays a project rifle to school Director Bob Thacker and the author. Many gunsmiths go into the firearms-outdoor field with the hope that some day they can make a personal impact on the market. One of the better ways to accomplish this is to attend one of the nation’s gunsmithing schools, gain additional experiences working for a company and then strike out on their own. The Career Fair portion of the event consisted of bringing gunsmithing students from eight schools to talk to potential employers and expose them to successful gunsmiths. Schools represented at the event were: Trinidad State Junior College in Trinidad, Colorado, (www.trinidadstate.edu); Pennsylvania Gunsmith School, Pittsburg, (www.pagunsmith.edu); Montgomery Community College in Troy, North Carolina, (www.montgomery.edu); Pine Technical College, Pine City, Minnesota, (www.pinetech.edu); Wabash Valley College, Mount Carmel, Illinois, (www.iecc.edu/wvc ); Colorado School of Trades, Lakewood, Colorado (www.schooloftrades.edu); Murray State College, Tishomingo, Oklahoma (www.mscok.edu); Piedmont Technical College in Greenwood, South Carolina, (www.ptc.edu). These schools offer specialized programs that may run only a few weeks to Diploma programs that include over a year’s study and might cost $30,000. Courses at these schools range from traditional gun stocking and metal finishing, to engraving, to CAD design and CNC machining. Each student is encouraged to discover what aspects of gunmaking appeals to him and concentrate on developing core skills in that direction. Along with the hands-on instruction are courses about the legal and practical aspects of running a gunsmithing business. A video done with Bob Thacker about the Pennsylvania Gunsmith School’s 15 courses may be seen at: http://youtu.be/Q1I9HKLTnUk. 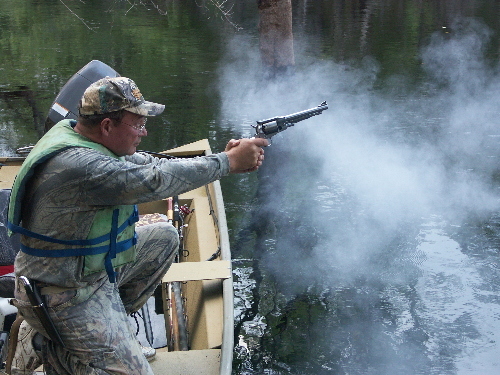 Taking a Georgia alligator with a muzzleloading revolver. An additional opportunity is that I offer is a three-month internship with me at Whitehall to learn modern media communications. This includes helping me put out my usual products of books, videos, blogs while also taking an independent project on their own under my supervision. This is a custom-designed internship where the student will learn what form of media expression he/she is most adept at and how to use it to publicize their own work. This is like “moving in with grandpa” in that interns live with me at Whitehall, and work under my supervision five days a week while also helping me keep the house and yard up. For two days they may work on their projects or even make one weekend trip home. At the conclusion of the internship they will have produced, or be on the way to finishing, a body of independent work of their own, a recommendation from me and have obtained a much better feel for the outdoor business world and how they can best make a living doing what they love to do. To find out the details of what I do and what interns would be exposed to go to my website www.hoveysmith.com. There you will find links to my books, blogs, videos, products and industry consulting activities. Interns travel with me when I go to writers’ conferences and cover events like the Shot Show. They will help me shoot and edit video productions, edit print copy for books, start their own blog, shoot publication quality still photos of firearms and related products as well as have the opportunity to meet potential employers. They will also be introduced to crossbow hunting, muzzleloading hunting and bowfishing – subjects that are not often fully covered by classroom instruction. The end result will be a gunsmith with a demonstrated ability to communicate with all aspects of modern media on a professional level. Successful candidates will likely have already produced written or video materials or should do so while successfully completing their gunsmith training. This position is open to men and women as well as to couples who want to work together in this field. Video and writing samples are required as are telephone interviews. I have immediate openings.